Influenced by a close-up photograph I snapped of my young son while sharing a late summer afternoon lunch at the beach, I founded the company, SoCoolKids, in 2012. Dampened by the ocean, his wet hair brushed from his face, the fresh image resembled an advertisement for skin and hair care! For months, I began noticing children's ads and marketing; and wondered why they all seemed either animated or graphic -- and, not reflective of children's inherent beauty. Inspired by CoverGirl, and the clean, natural images that drove their iconic marketing campaign, I developed a Skin and Hair Care Product-line geared to the unique needs and tastes of children. Made in the USA, in Los Angeles and upstate New York, SoCoolKids products maintain the highest standard of performance. Both, my stepdaughters and son, revel in the casual romance of the Sun Valley Mountains and skies; and the vast California shores. Like its content, SoCoolKids' packaging encapsulates these experiences of the great outdoors. SoCoolKids aspires to embrace children in all walks of life. The Product Line consists of: daily shampoo and everyday conditioner; watermelon, mango, orange and banana glycerin soaps -- the surf-sand soap relays the smell and feel of the beach -- with an exfoliating quality. SoCoolKids's all-American, all-cotton t-shirts and sweatshirts provide a comfortable wear and ease of movement; and relaxed and classic aesthetic. Live Naturally. Stay Beautiful. Be Cool! Immediately upon opening the box, the wonderful aromas of the soaps filled our home. My kids couldn't stop themselves from smelling all of the soaps again and again! Big N. decided his favorite was the Watermelon and Little A. really loved the Banana! Pleasant scents that make your bath or shower time much more fun! Solid bars that you know will last a while and are easy to hold when wet. Surf and Sand soap contains no parabens, no gluten, no synthetic dyes, and no synthetic fragrances. Attractive packaging. 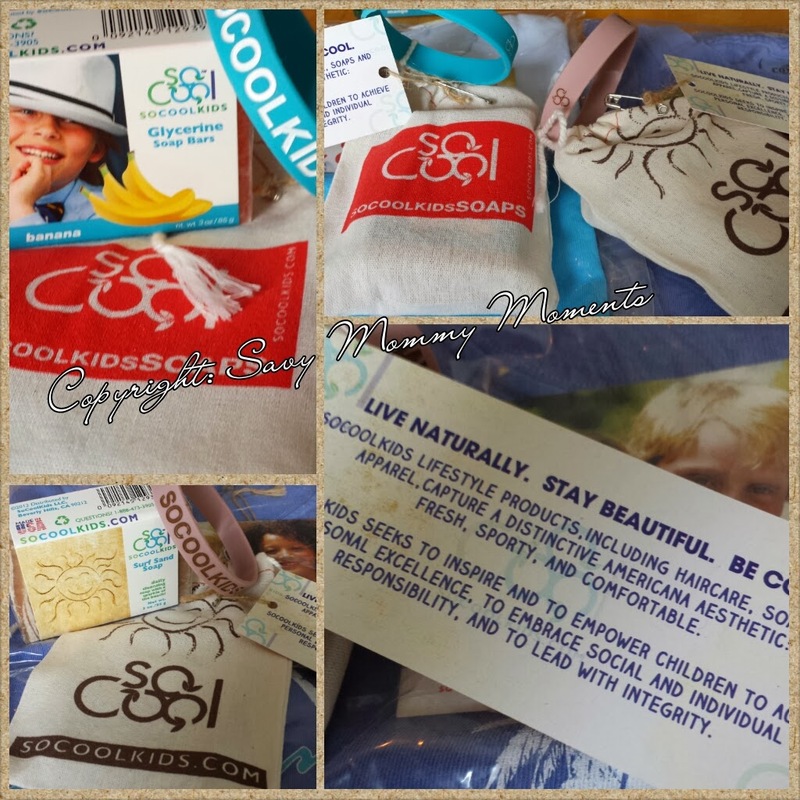 Some of the soaps were wrapped in these cool little fabric sacks with SoCoolKids bracelets! Glycerine soaps come in fun colors that are eye appealing for any kid (or kid at heart). We also really love the t-shirts. They are a little bit big for my kids now, but I had to take them out and check out the quality. They are made from 100% cotton and are so soft! I love that when you take them out of the package they don't feel like you need to wash them. I can't wait for summer for my kids to wear them! I have a feeling Big N. is really going to love the feeling of the fabric on his skin. I really love the design on the California T as it makes me think of summer fun! 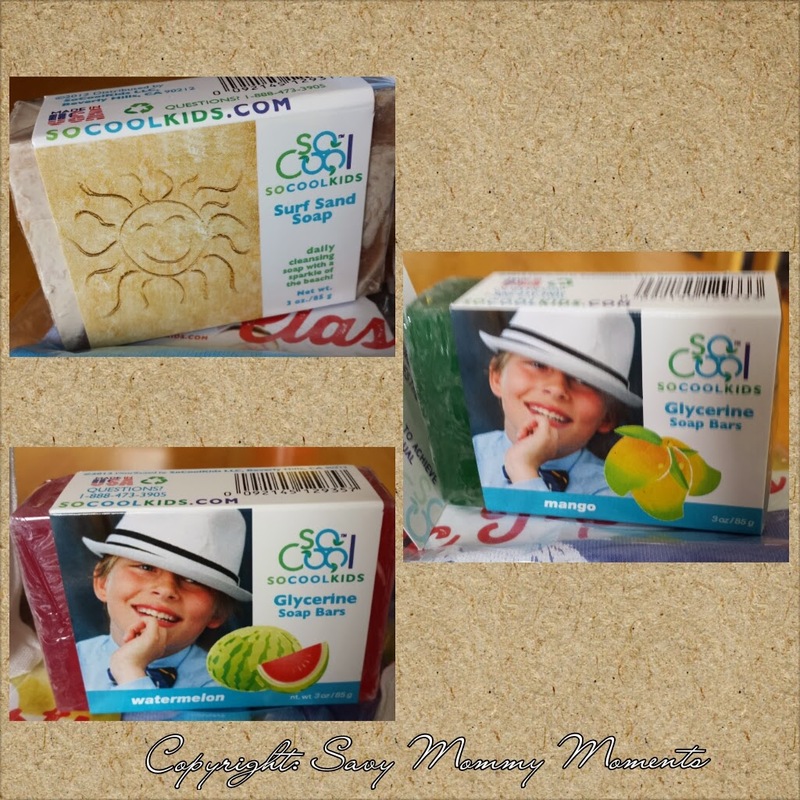 Overall, we love the entire SoCoolKids line of products and can't wait for you to try them with your family! 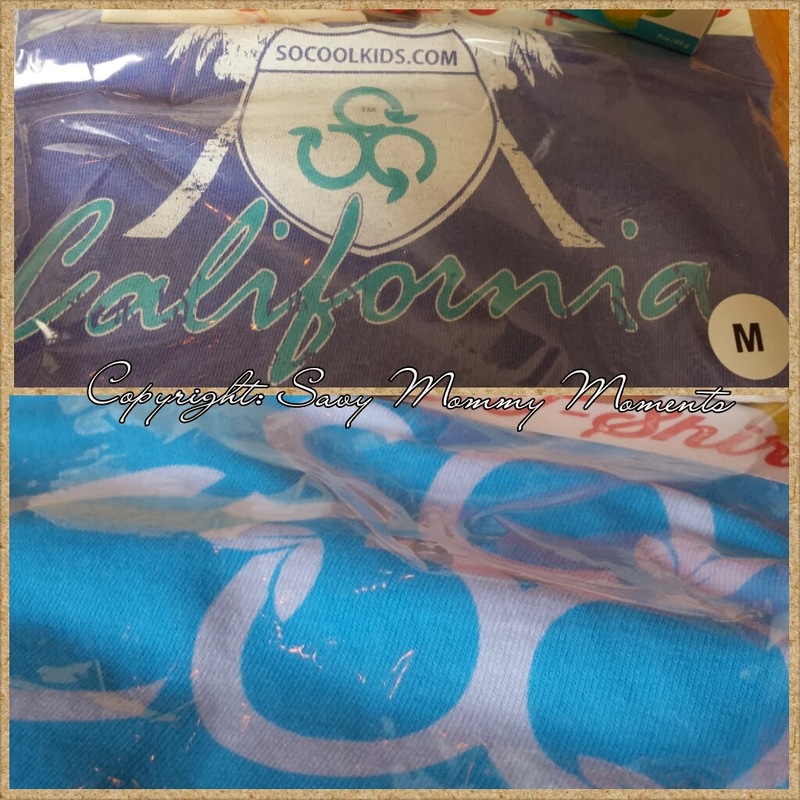 Learn More/Purchase: You can learn more about SoCoolKids and browse their entire product line on their website! Social Media: Keep up with the latest and greatest by following them on Facebook , Twitter and Pinterest. 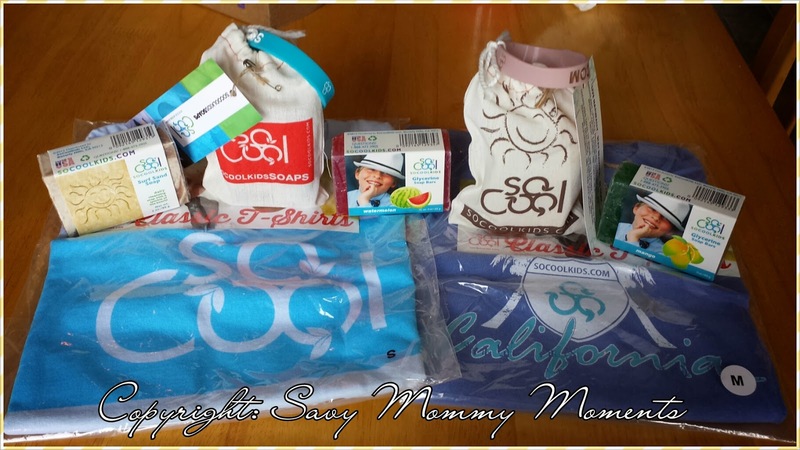 Win: Enter below to win a SoCoolKids prize package! Open to U.S. Only. Giveaway ends 2/3/14 at 11:59 pm CST. I love the Surf Sand Soap. I haven't ever heard of soap with sand in it but it seems like a great natural alternative to the average store bought exfoliants. I'm always trying to find ways to reduce the amount of chemicals we use in our home. These seem worth a shot! I like the Surf Sand Soap since it's gentle, and it just looks fun to use! I like the surf sand soap. Looks like it might really get the dirt off my kid. I like the gylcerine soap. I used to think it was so cool when I was a kid. I like the Watermelon Glycerine Soap because I think it would smell good. I also like the surf and sand soap. It looks unique! The watermelon glycerine soap I think would be a favorite at our house - looks nice and I hope would smell good too! My son would LOVE the CALIFORNIA FLEECE CREW, because his best friend moved there. I love the surf sand soap because it has exfoliant in it plus the color looks nice. I love the surf sand soap! just gentle enough for my little guy and it smells great! I want to try the surf-sand soap. I like exfoliating soaps, but most are too harsh for the kids. This would be great for when they get into a big mess and need a little extra scrubbing. The surf sand soap looks like an awesome product! I like the power up tshirt. I like that they help childhood cancer charities. Glycerine Soap Double Bar looks like something I would love to try!